For over 12 years Global Software Leads have delivered high quality, researched technology marketing lists and intelligence. Our most popular ERP Lists include our SAP Customer List, Oracle EBS Customer List, PeopleSoft Customer List, JDE Customer List, Microsoft Dynamics Customer List, Infor Customer List along with many more ERP and Technology focused Lists. Through our focused research, business intelligence and a Global database of companies, we help our clients understand, target and build relationships with key enterprise wide decision makers at all levels. #OracleEBSCustomerList – Working with over 160 Oracle partners globally we provide a valuable resource for campaign marketing and lead generation activity for sales and marketing teams. 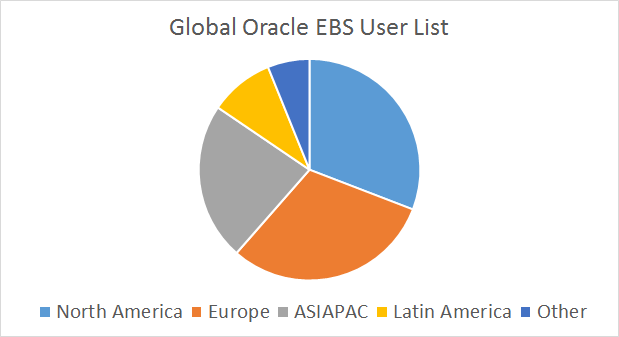 Our new Global Oracle EBS Customer List includes over 22K Oracle EBS users globally and includes all researched companies and over 190K key decision maker including senior management, IT, Finance, Purchasing, HR and many more. If you have any requirements or to get a specific count and cost for our Global Oracle EBS Customer List please email us at: sales@globasoftwareleads.com or peter.davies@globalsoftwareleads.com use the contact details at the bottom of the page.